Up next in my profile series is a MAN. One of the biggest linemen in this draft. If there is a guy you’re still very interested in Leave a comment with the name. Production 2 2005: Signed with Ole Miss but attended Hargrave Military Academy. 2006: (12/12) Started every game at right guard and earned freshman All-SEC honors from league coaches. 2007: (12/9) Played in all 12 games, including nine starts at right guard. 2008: (13/13) Moved to right tackle and started all 13 games. Height-Weight-Speed 3 Massive, wide-body ROT/OG with marginal foot speed. Has size that cannot be coached but also has lots of work to do in the weight room. Durability 2 No major injuries to our knowledge. Has played in 37 games during three year career thus far. Intangibles 2 Comes from good football bloodlines. Brother Peria Jerry was a first-round pick by Atlanta in 2009. Two of his cousins  Eddie Strong and Dwayne Rudd  played in the NFL and another cousin, Jamarca Sanford, is currently starting at safety for Ole Miss and is also an NFL prospect. Awareness 3 Good game experience and versatility. Knows his assignments. Shows adequate feel for picking up stunts and blitzes. Toughness 4 Massive offensive lineman who can envelop some smaller defenders at the point of attack. Plays to the whistle and gives adequate effort to sustain his blocks. However, he does not appear to play with a chip on his shoulder. Not the type consistently looking to pancake opponent. A bit underwhelmed in this aspect of his game. Pass Protection 4 Wide-body OL with long arms who is difficult to get around. Adequate anchor versus bull rush when he’s set and in position. However, he’s not a natural knee-bender. He possesses marginal agility. He is a leaner who really become vulnerable when off-balance, which is more often than we’d like to see. Also gets exposed by sped rushers off the edge. Run Blocking 2 Massive OT/OG prospect capable of creating a new line of scrimmage in the run game when he gets into position on time. Not an overly-explosive blocker and must improve his power at the point of attack. Limited range. Slow first step. Late getting in position as a second-level blocker and really struggles to hit the moving target in space. NFL scouts are hoping that the success of rookie Michael Oher with the Baltimore Ravens can be duplicated with another all-conference Rebel. The massive Jerry has the size NFL evaluators are looking for and shows surprising agility for a big man.The brother of Atlanta Falcons 2009 first-round pick defensive tackle Peria Jerry, John earned second-team All-SEC accolades from the media and league coaches after his first season at right tackle and first-team accolades from both groups this past season. He started the 2007 season at right guard, which is where some scouts feel he may project best in the pros.Jerry came into the Senior Bowl in great shape, though, looking almost svelte playing right tackle at 332 pounds. He lost another four pounds for the Combine, where he moved quite well for his size. His work in the off-season may have gained him a spot in the top 75 selections. Pass blocking: Strong punch at the snap as a pass blocker. Sticky hands and can control the pass rusher when he locks on. Can bend at the waist instead of his knees, especially as he wears down. Doesn’t consistently place his hands accurately or move his feet actively when in pass protection and too often is left leaning or attempting to recover due to slipped blocks. Has to show more consistent lateral agility and balance to be considered an offensive tackle — instead of a guard — in the NFL.Run blocking: Good initial pop at the line of scrimmage to stun the defender and can overcome his opponent with his strength and mass as a run blocker. Shows some nastiness and looks to pancake his opponent if he senses he’s off-balance. Relies on his mass to gain movement at the point of attack.Pulling/trapping: Surprising agility to get out and around the line. Good initial quickness off the snap, but loses speed quickly and struggles to adjust to moving targets at the second level.Initial Quickness: Good first-step quickness for the down block, but this is not one of Jerry’s relative strengths. Can struggle with smaller, quicker defenders, at least until he gets his hands on them.Downfield: Intimidating presence at the second level and can wall off defenders from the ballcarrier. Struggles to adjust in space, and too often whiffs at the second level.Intangibles: Massive man. Not just big, but very strong. Broke the Ole Miss record with 34 repetitions of 225 pounds last year — a difficult feat considering his long arms. Too heavy and carries unnecessary weight around the middle, which clearly caused him to labor in the second half of games during the 2008 season. Played last season in the 350-360-pound range, but Ole Miss coaches would have liked him closer to 325. 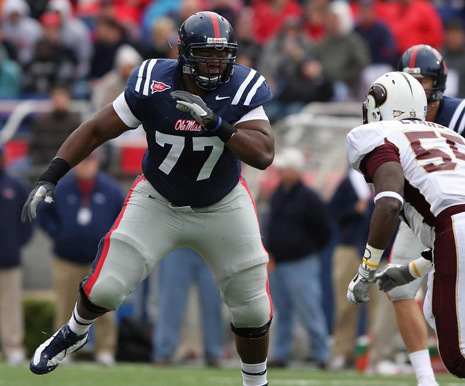 The brother of Atlanta Falcons 2009 first-round pick Peria Jerry, a former All-SEC defensive tackle for the Rebels. A king-sized lineman who plays RT on the Ole Miss offense, Jerry simply lacks the athleticism to consistently reach the corner vs. speed off the edge. He showcases good lateral mobility and redirection skills for his size but lacks the quickness to hold up on the outside in the NFL. He has the makings of a physical inline guard at the next level where he can use his power and strength to maul defenders in the run game. Jerry possesses long, strong arms and powerful hands. Once he locks on in the run game, he does a great job pumping his legs and driving defenders off the ball. He can certainly anchor at the point of attack in the pass game, and once he gets his hands on an opponent, the battle is over. He is a Leonard Davis-type guard at the next level. I think you when think about the New York Giants traditionally and their power running game you’d imagine huge offensive linemen knocking guys off the ball with Huge Brandon Jacobs knocking people over, but that’s not really the kind of offensive linemen the New York Giants are. Their biggest listed OL is Kareem McKenzie at 6’6 and 325 pounds. Rich Suebert is 310 pounds, Ohara is 303, Snee is 317 pounds. These are not huge offensive linemen. But maybe that’s what the Giants need. I have no qualms about the Giants upgrading their offensive line in this draft, in fact I hope they do. The question is when. 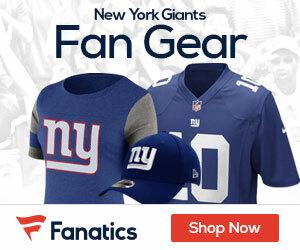 I’m hoping a top Ot falls down to the #15 overall pick, but if not this is definitely a way the Giants can go. The problem I have with Jerry is that he had to lost 40 (maybe more) pounds during the pre-draft process. And spending a second round pick on a guy who might eat himself out of the league, or might always be battling weight problems is a little scary. Now, in the third round I like this possibility much more.